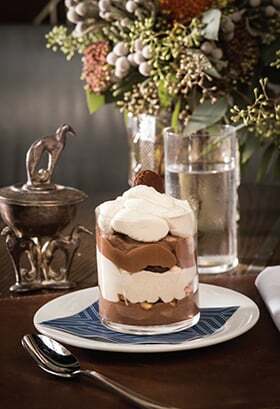 All aboard: The chocolate parfait with layers of spicy peanuts and peanut butter whipped cream. If “romantic bus travel” ever existed, the only evidence is Frank Capra’s 1934 film classic, It Happened One Night (original title: Night Bus). Even then, before Clark Gable and Claudette Colbert fall for each other, the couple are thrown together for a cramped, bumpy ride. But Savannah’s sleek year-old restaurant, The Grey, shows you how it might have been possible. Outside, the restored Greyhound station’s streamlined, curved shape and panoramic windows suggest a rolling motor coach. Inside, the original ’30s Art Deco details, down to the worn terrazzo floors, walnut paneling and numbered bus bays, hint that hungry, weary travelers waiting for their rides enjoyed more than just food and shelter – something Mega-bus’s shivering ticketholders might especially appreciate. Of course, this place, like the words “Atlanta public pool” or “Birmingham lunch counter,” also conjures other kinds of memories – not so warm, and not so distant. With Chef Mashama Bailey at the wheel, The Grey becomes another kind of vehicle – one that shows how far Savannah has journeyed since the days such public spaces were segregated battlegrounds. Those updates start with a simple amuse-bouche: a creamy-centered hardboiled egg, with a sprig of tender celery leaf. (FYI, reservations can be scarce, but you can enjoy a more casual array of transit-themed cocktails and light snacks, such as oysters on the half-shell, ham and cheese, a schnitzel sandwich and the like, in the bar, where you will feel like a character in Edward Hopper’s Nighthawks.) On the full dinner menu, the pickled oysters are another good starting option, their briny sweetness enhanced by slices of Serrano peppers and translucent lardo (spice-cured fatback). Seafood boudin – plump little crawfish-shrimp-Carolina gold rice sausages, nestled among crisp prawn chips, drizzled with whole-grain mustard garnish – was a standout, along with the excellent smoked collards with leek, onion and shallot and a little side of mignonette. The grilled, sliced hanger steak will satisfy the carnivore at the table, with its crisp disk of potato pancake and fenugreek aioli, but with so many intriguing options (pork shank with “a mess of greens” and cornbread? Beef liver with gravy and polenta? Spicy roasted eggplant with peanut, chili d’Arbol and tomato? ), I almost wished we’d chosen something less prosaic. Then again, the chocolate parfait sounded prosaic, but wasn’t. Oh, it’s the familiar shape and texture, but the spicy peanuts and peanut-butter cream layers between chocolate mousse revved it up considerably. On one wall, a huge, folk-art-style painting depicts an old-fashioned bus transporting smiling people of all races. Its simple hopefulness reminds you a little of another Capra film – the Christmas-themed It’s a Wonderful Life. In it, an ordinary man endures a dark night of the soul to learn how his life and work shaped his community for the better for its next generations. Here in Savannah, such people might have marched or picketed on the street out front, before it was renamed MLK Jr. Boulevard. That’s one of the best things about The Grey. Even sitting still, you feel like you’re going somewhere. Outdoor lunch, Saturdays 12-2 p.m. Parking: Valet (for a fee), on the street or in lots. Speaking of Savannah’s newly charged scene,Two relative newcomers – Ampersand (near The Grey, at 36 MLK, www.andsavannah.com), and The Collins Quarter (151 Bull St., www.thecollinsquarter.com) – show how local options have amplified recently. The pleasantly scruffy Ampersand is a great place for font-themed cocktails like the Typesetter and Slab Serif; at The Collins Quarter’s bright and airy “Melbourne-style cafe,” take a break for fierce, fresh-brewed coffees and healthy breakfast, lunch and (recently expanded) dinner choices like smashed avocado, feta and radish on Beaufort Artisan Bakery toast, or the daily catch with a chili-fried egg on a flat tortilla.